The Texas-OU game is a football tradition, held annually in the Cotton Bowl during the State Fair of Texas. 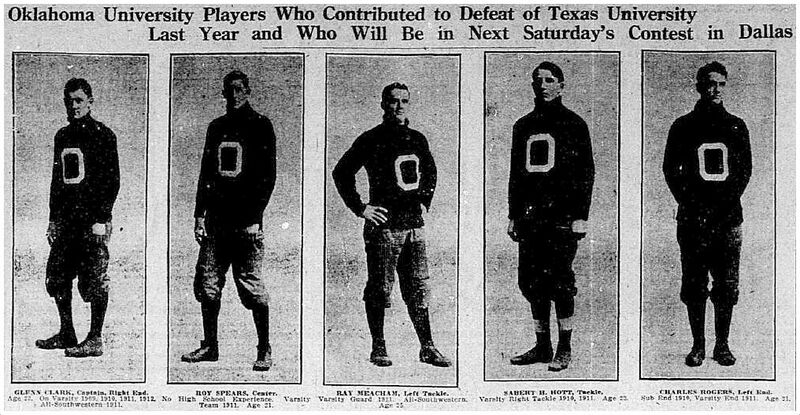 The first game of the so-called “Red River Rivalry/Showdown/Shootout” was held in Dallas (aka “neutral ground”) in 1912. As the Cotton Bowl hadn’t been built yet, the game was held at Gaston Park, a sporting field with a large grandstand where Dallas teams played baseball, football, and, yes, even soccer. It was located at Parry & Exposition, in the spot where the State Fair Auditorium (now known as the Music Hall) was built in the 1920s. The 1912 football season began with new rules: downs were increased from 3 to 4; touchdowns were now 6 points instead of 5; the playing field was reduced from 110 yards to 100; the onside kick was abolished; a touchdown was permitted when caught over the goal line; the ball was kicked off from the 40-yard line instead of midfield; the intermission between quarters was reduced from 2 minutes to 1. The Sooners’ coach, 37-year old Bennie Owen (whom I gather is something of an OU legend), had only one arm, the result of a hunting accident. The Dallas Morning News wrote that Owen was “one of the most able [coaches] in the country. He is disabled to some extent by having but one arm, but evidenced by his success during the past season, this does not trouble him to any great extent” (DMN, Oct. 6, 1912). The Longhorns’ coach, Dave Allerdice, was only 25 years old. 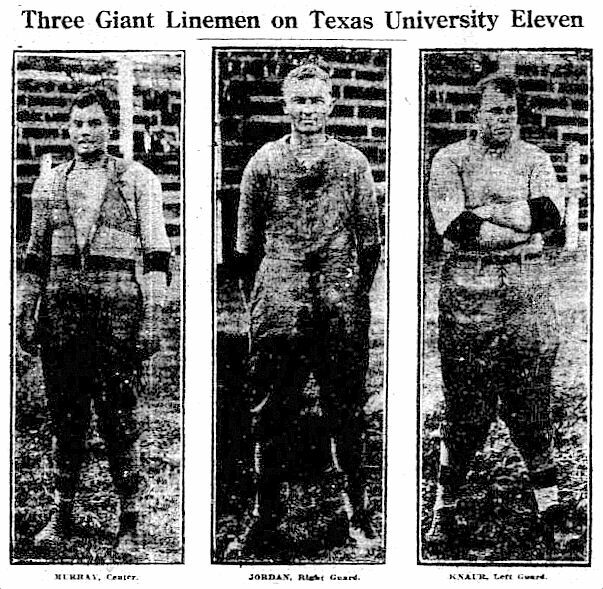 He had been hired to fill the spot left vacant in the wake of the death of UT’s previous coach who had died rather exotically as the result of “a fall out of the window of his bedroom” (DMN, Oct. 10, 1912). Both Allerdice and Owen had been coached as students by the same man, Coach Yost, at Michigan. The Gaston Park crowd was estimated at over 6,000. The crowds going to the game and to the fair were so great that the streetcars and Interurbans were jam-packed. In fact, both teams had difficulty making it to the game on time because they couldn’t find transportation to get there, and the game had to be started late to allow for the players to arrive and warm up. Oklahoma dominated the game, and the Sooners won, 21-6. And so began the annual Texas-OU tradition in Dallas. Grainy, off-kilter image of the crowd-frilled grandstand at Gaston Park. It’s a bit hard to see anything in these 100-plus-year-old photos, but here are a couple of “action photographs” of the game. Gaston Park? 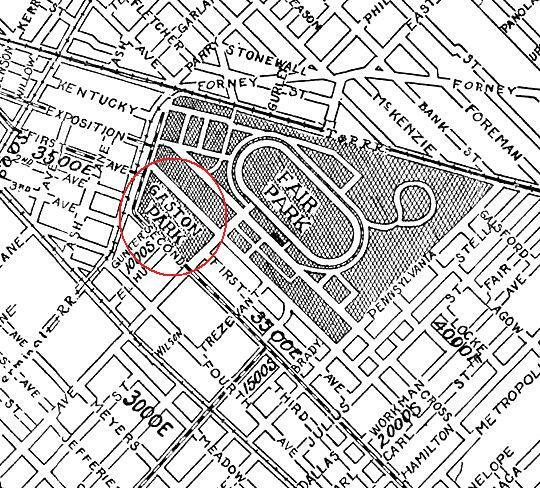 Here’s where it was (a lot of street-renaming has gone on since this map was drawn in 1919). All photos from The Dallas Morning News. 1919 map (detail) from the Portal to Texas History, here. For slightly better photos of Gaston Park (in 1908), see a previous post, here. “Red River Showdown” (which I’ve never actually heard anyone other than TV commentators and promoters say to describe what everyone I know calls the “Texas-OU game”), here. 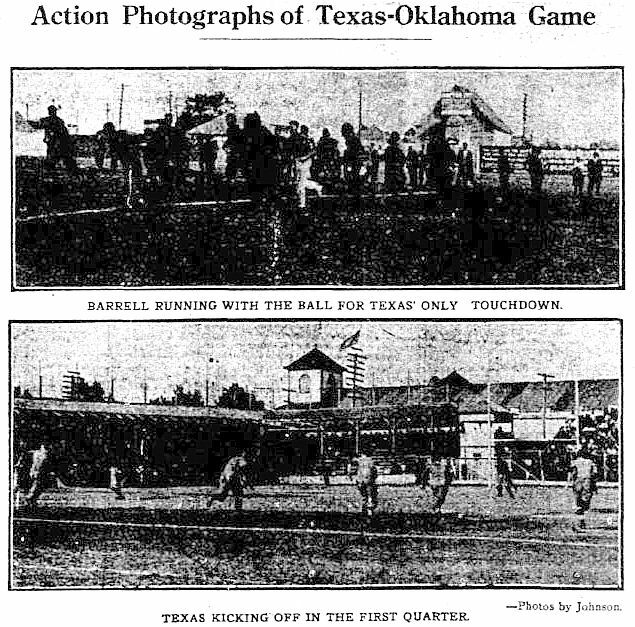 The Dallas Morning News and The Fort Worth Star-Telegram are filled with numerous contemporaneous articles about this game. If you have a handy-dandy Dallas Public Library card (free! ), you can pore over these articles to your heart’s content. To read what was printed the day of the game (Oct. 19, 1912), click here. To read about the results and the game coverage, click here. Click pictures for larger images. They will still be muddy and grainy, but, by God, they’ll be bigger. It’s interesting – the rule changes that took place in that year are ones that further the differentiation of American football from rugby, which was a prior code of football and is the ancestor of what we call “football” in the USA.